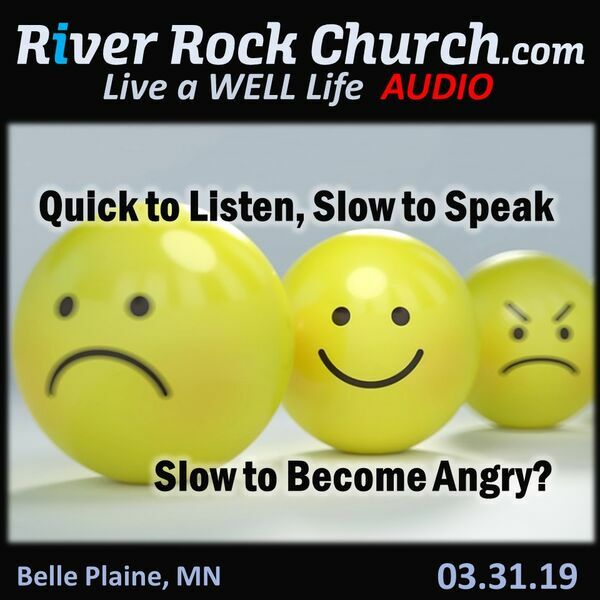 River Rock Church - Quick to Listen, Slow to Speak and Slow to Become Angry? Everybody seems to be so angry these days and occasionally it is OK to be angry. The Apostle Paul warned: “in your anger do not sin.” Jesus who never sinned was so angry he flipped over the tables of the money changers in the temple and chased them out with a whip. Jesus half-brother James taught, “…You must all be quick to listen, slow to speak, and slow to get angry. Human anger does not produce the righteousness God desires.” James 1:19-20. There’s an old saying that is wise and true, “Anger begins with madness and ends in regret.” While it’s true that some Christ-followers are too nice, we certainly don’t honor God and fulfill His purpose for our lives by being easily angered. Listen and be encouraged to communicate and control your emotions in a way that blesses others and benefits you.